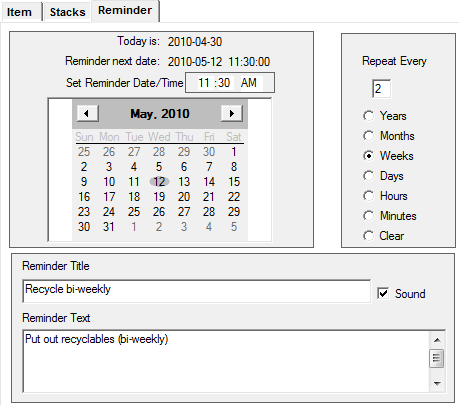 Reminders - (NoteFrog v1.6 and up) provide the capability to create a "pop-up" reminder, which will be displayed from NoteFrog when it becomes due. NoteFrog must be active for reminders to display. Enter the date and time at which you want the reminder to appear using the "Set reminder Date/Time" control. The time may be entered as hour - minute - AM/PM/24. The date to appear is entered via the calendar control. If you wish to have the reminder repeat per a cycle, enter the appropriate repeat cycle information in the "Repeat Every" control. e.g. Repeat Every 2 Weeks. Enter a "Title" for the reminder. If you would like an audible sound to occur when the reminder occurs, check the "Sound" control. Enter the text you would like to appear in the "Reminder Text" area. This area may contain clickable links, if entered in http:// format. Save the reminder as you would any new item. Each reminder will display a pop-up window in the lower right hand corner of the main window when it occurs. TIP To cancel/clear a repeating reminder, simply click the trash icon that appears on the reminder when it is displayed. To accept/acknowledge the reminder, click the check mark. You may only edit an existing reminder from within the nf_reminders stack. From the nf_reminders stack you may select the appropriate reminder and make any desired changes. To create a new reminder while you're in the nf_reminders stack, you must first create a new blank item. Then enter the new reminder information from the reminder tab.